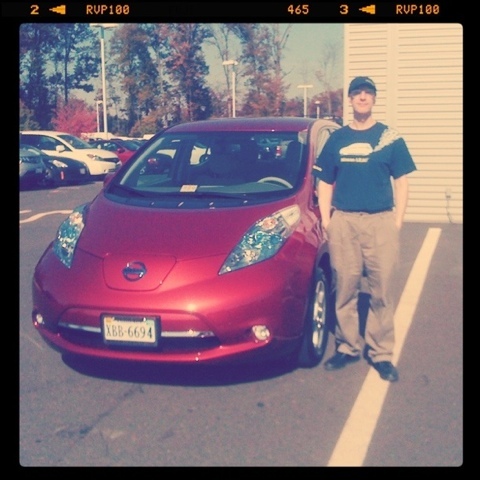 Affordable Electric Car NOW: I am Electric! This morning I took possession of the very first Nissan LEAF sale on the Eastern Seaboard, and also the very first 2012 model year LEAF. Don't believe me? Well neither do I, but I haven't heard from anyone disputing the title so I'm claiming it as my own! Having owned this car for the past 5 hours, I can say it is frankly driving bliss. Sure, the cost was exorbitant and it's missing its Zero-Emission graphic due to a snafu at the dealership, and I'm still unable to order new clean fuel plates, but man, what a sweet, sweet ride! Congratulations! I don't mean to burst your bubble, but I got mine on Saturday :-) And it was only 1 year, 6 months and 9 days after I pre-ordered it. Hmm. I ordered a bit before you and you probably paid a little less since Nissan of Chantilly has a $520 or so processing fee. Grrr. Your order wasn't even placed by 25 July; so no bragging on the order wait. We did, after all, have extremely short wait times relative to most 2011 waits. Jeffrey, I'm happy to read that you received your car. I got my 2011 this past weekend but this week I hadn't been outside on a nice day to photo it. Until today. P.S. The Silver looks stunning! I just found your blog and am catching up. Did you ever get the Clean Fuel plates?